This Picture Frame Uses Magnetic Technology and Has a Modern Design! This Picture Frame is Featured in a Silver Finish! Discount Poster Frames are Stocked by the Thousands in our Quick Ship Warehouse! 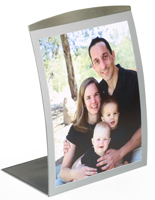 4" x 6" 5.5" x 8.5" 8" x 11.5"
Picture Frame in Silver Utilizes Magnets for Easy Display Options, 11" x 17"
This picture frame comes with a magnetic flick frame, permitting you to reach the contents effortlessly and quickly. Exchange images and media content in seconds! Merely lift the frame up and place the graphic in the back of the non-glare lens. We supply the picture frame with a non-glare lens to shelter the contents below from being damaged, and to prevent reflection from hindering your images. 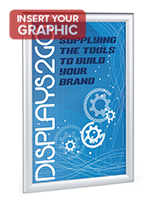 This picture frame is an economical way to promote such things as daily menu specials or even a promotional event for your retail store. 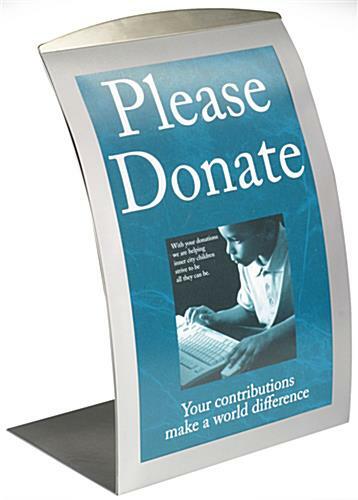 Additionally, we offer this sign display in a black finish as well. 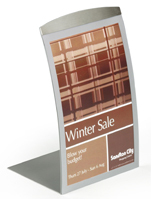 This picture holder, picture frame is an affordable preference for showcasing media content and other images. This picture frame has a sleek, curved design. 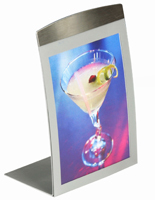 Place this picture frame on any countertop or tabletop location to attract attention! 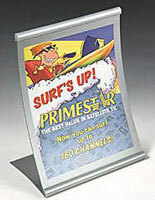 The picture frame is made of rugged, silver aluminum, a neutral finish to match with any setting. 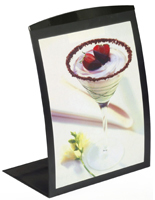 The picture frame, also recognized as a display holder, accommodates 11"w x 17"h images. 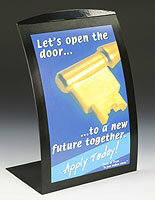 The picture frame can be utilized to promote menus, pictures, announcements and media content.